When your dog has food sensitivities, knowing exactly what’s in their food is important. That’s why our ingredient lists are purposefully short, made with ONE ANIMAL PROTEIN and ONE VEGETABLE, versus the mix of each you’ll find in most other dog foods. 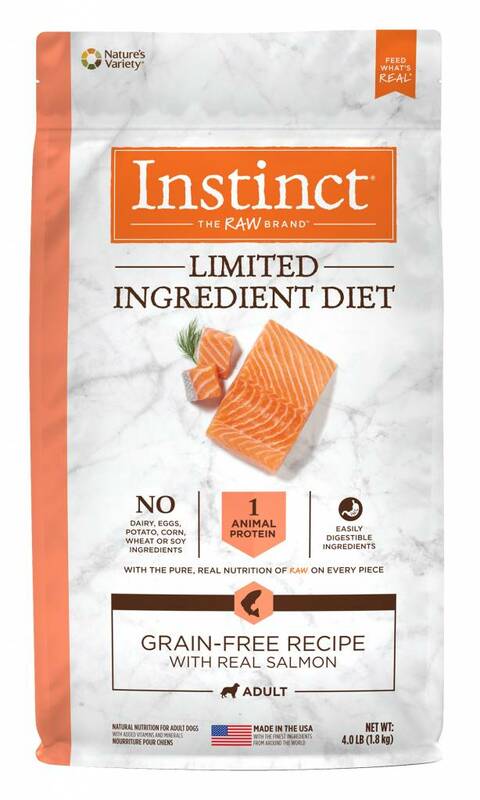 Guided by the purity and simplicity of raw, Instinct Limited Ingredient Diet Grain-Free Recipe with Real Salmon is simple and essential nutrition your dog needs to thrive. Salmon Meal, Peas, Tapioca, Salmon, Canola Oil (preserved with Mixed Tocopherols and Citric Acid), Natural Flavor, Montmorillonite Clay, Coconut Oil, Potassium Chloride, Salt, Choline Chloride, Vitamins (L-Ascorbyl-2-Polyphosphate, Vitamin E Supplement, Niacin Supplement, Thiamine Mononitrate, d-Calcium Pantothenate, Vitamin A Supplement, Riboflavin Supplement, Pyridoxine Hydrochloride, Vitamin B12 Supplement, Folic Acid, Vitamin D3 Supplement, Biotin), Minerals (Zinc Proteinate, Iron Proteinate, Copper Proteinate, Manganese Proteinate, Sodium Selenite, Ethylenediamine Dihydriodide), Freeze Dried Cod, Rosemary Extract.